Nora Meets Nick | The important thing is the rhythm. Always have rhythm in your shaking. On Saturday 10/13, there will be a casual gathering in the Dubliner, which you can get to through a door in the lobby. We’ll be gathering for drinks and a chance to unwind from travelling and preparations. If you are around, we would love to see you before you head out for dinner. The back bar has been reserved for our party from 4:00-6:00 pm. Ask for the Poe or Debelack party. All are welcome; the Dubliner is family friendly. When we first started planning the wedding, we began accumulating things we thought might be useful: for design ideas (sort of a lookbook, but a collection of objects and not just pictures); for the reception itself (decorations); or for the guestbook (a surprise). Once I started putting all those things together into an idea for the invitations, I kept coming back to some vintage souvenir folders we had bought from eBay, featuring illustrations of various DC sites. In trying to figure out a use for the images I had scanned from one of them, I hit on the idea of an era-appropriate guide book for DC. The invitations themselves came together quickly after that (PDF). 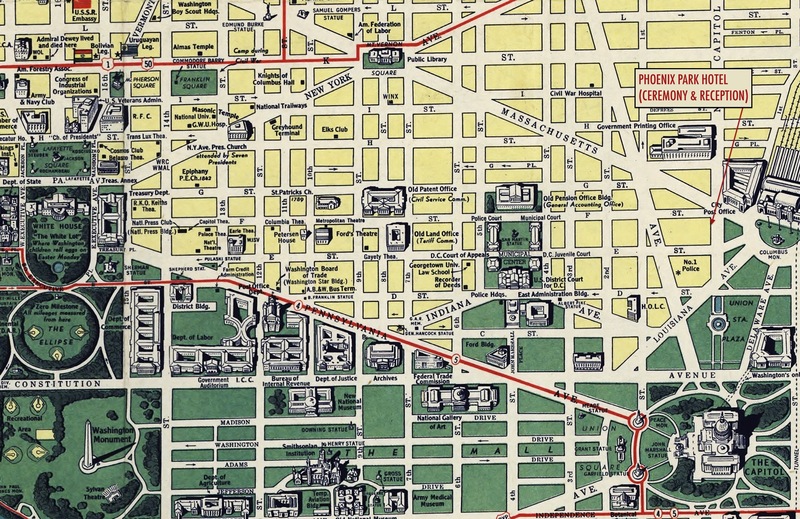 To go along with that guide book theme, I modified this Esso map from 1942 from the BIG map blog to remove the pointer to the Standard Oil Building and replace it with a pointer to our venue (JPG). Including the map gave me the opportunity to add the “full color map included” declaration to the invitation itself for extra authenticity. The back of the map is our info card with details for the ceremony and reception and information about the hotel (PDF). 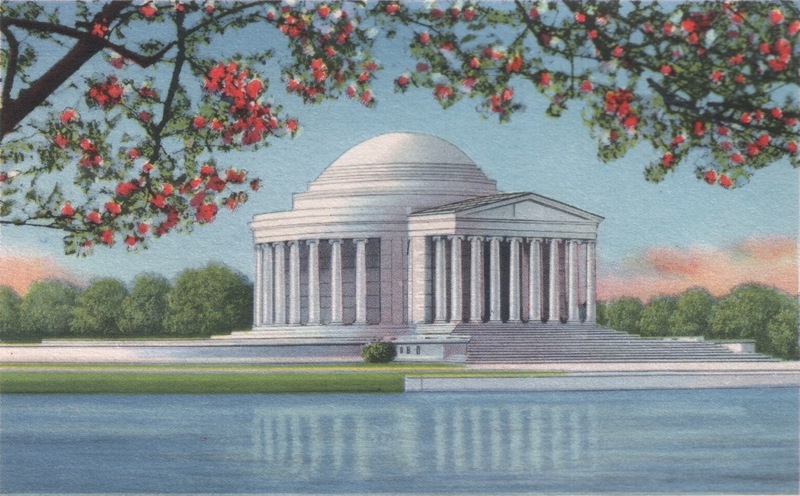 For the response cards I reserved an image of the Jefferson Memorial from the same souvenir folder I had used for the invitations (JPG). And here’s the back of the response card (PDF). The response cards include a link to the RSVP function on this very web site. This function is connected to our guest list to keep out casual snoops. The fonts in the invitation packet are the same as this web site, with one addition. For the invitations themselves I added Futura, a geometric sans-serif font dating from 1927 in its original form. For the printing we used Vistaprint and were very happy with the results. We were lucky that the USPS introduced commemorative stamps to celebrate the centennial of the cherry blossoms in DC, with illustrations of either the Washington Monument or the Jefferson Memorial. These stamps were perfect for our invitations. The invitations have been very well received. We are happy to share them with you. Some of DC’s best bars also serve some of DC’s best food. Room 11 is about halfway between the Columbia Heights and Georgia Avenue metro stations. It’s a tiny space, but they are in the middle of an expansion. Grab a seat on the patio and enjoy a few of the small plates with your inventive cocktail or wine, or come by for Sunday brunch. In Logan Circle, we love Estadio. Right across from the Studio Theatre, where Kate teaches, it’s a great spot to eat before catching a show. If you like gin & tonic, this is the place for you. The multiple choices are all mixed with house-made tonics. We love sitting at the bar and indulging in whatever small plates are recommended to us. Ed is, among other things, a writer for We Love DC, a local web site. His focus is on cocktails, which are in ample supply in DC. We’ve been lucky to get to know some of the best bartenders in the city (if in doubt, visit any member of the DC Craft Bartenders Guild). While you’re here, be sure to try a Rickey, the official drink of DC. We’ll be listing some of our favorite places for cocktails in DC. These are located in the Penn Quarter area, not far from the hotel. The Passenger has become well known in two short years, and we’re regulars at its “hangover brunch” on Sundays, which runs from 2pm until 11pm. We’ll even be holding our after-party there (think of it as the day-after brunch, only immediately following the reception). It’s a low key atmosphere with great bar food, drinks, and people. Unlike many cocktail bars, a the Passenger there’s no set cocktail list. There’s a board with a few specials listed each night, but the best way to order is to say what you’re in the mood for. You can name a classic cocktail, or just suggest a general idea, like “gin and citrusy.” Your drink is usually exactly what you didn’t quite know you wanted. Not in the mood for a cocktail? See if you can get co-owner Tom Brown to choose a bottle of wine for you, or just order a beer on tap or from the extensive selection of cans and bottles. If you’re feeling fancy, try to get a reservation for the Columbia Room, the hidden bar-within-the-bar. Tom’s brother (and co-owner) Derek dreamed up this quiet, 10-seat shrine to the craft cocktail, now recognized by GQ and Food and Wine, among others. It’s a more mellow atmosphere influenced by Japanese cocktail bars, with quiet music, hand-carved ice, and house made bitters, tinctures, and aromatized wines. The standard offering is a tasting menu with paired bites, but you can also order à la carte. Our other go-to in the area is Fiola, named one of Esquire’s best new restaurants of 2011. The dining room is gorgeous, but we prefer to pull up a stool at the bar. Jeff Faile’s drinks are always spot on. If you’re “really into amaro,” Jeff has a drink for you. And while you’re there, you can also enjoy some of the best Italian food in the city. The menu changes to reflect what’s seasonal and fresh so we can’t really recommend anything specific, but we’ve never had anything that wasn’t excellent. Kate Debelack and Ed Poe are getting married on October 14, 2012. Here's where you'll find all the scoop on our wedding festivities. Photos from Shorpy, the 100 year-old photo blog, unless otherwise noted.